The Patatas is interested in all things innovative and we are always exploring different ways to benefit under-represented communities through innovation. A little background here, The Patatas is part of Potato Productions and it houses several other companies specializing in various industries. With this unique environment, we often come together to discuss potential projects and share our network of contacts with each other. Bernadette, who runs CompassLoft (one of our sister company), introduced us to VRM Biologik® when she heard about our interest in finding out more ways to benefit the communities we work with. During the meeting with them, the folks at VRM introduced us to two agricultural products – HumiSoil® and XLR8® Bio. Both of them build organic matter in the soil while fertilizing the plants with good bacteria. They also help to maintain the soil health, improving the nutrient transfer and water holding capacity. Unlike other chemical fertilizers that only focuses on fertilizing the plants, these two products continue to restore soil health while feeding the plants. With these two products, it’s possible to achieve more crop harvest in a shorter time. Imagine if we could get these two products into the communities that we work with, this could help to bring more food to their table, or even creating an additional source of income for them. XLR8® Bio is a bio-accelerant pioneered by VRM for soil enhancement and nutrient management. This product helps build healthy microbial populations in soil which continue to feed plants after fertilising. As excited as we were, we know that the project needed more planning and one of the first things to do is to conduct a simple experiment internally. We started the experiment in early Feb 2017 with two pots. One pot was the control pot which was filled with normal soil. The other pot was filled with HumiSoil® and sand (yes, sand! That’s how amazing the product is! ), with the addition of the XLR8® Bio solution. We planted chilli seeds in both pots. We watered both pots every 3-4 days. There were quite a number of interesting observations made during the experiment process. Surprisingly, the control pot plants sprouted first and the HumiSoil® pot took almost 4 days more to sprout. However, we noticed that the sprouts in the HumiSoil® pot were bigger and healthier looking. They also grew much faster and overtook the sprouts in the control pot in just 3 days. We also adapted the experiment 3 weeks later and added the XLR8® Bio solution into the control pot because the sprouts were wilted. 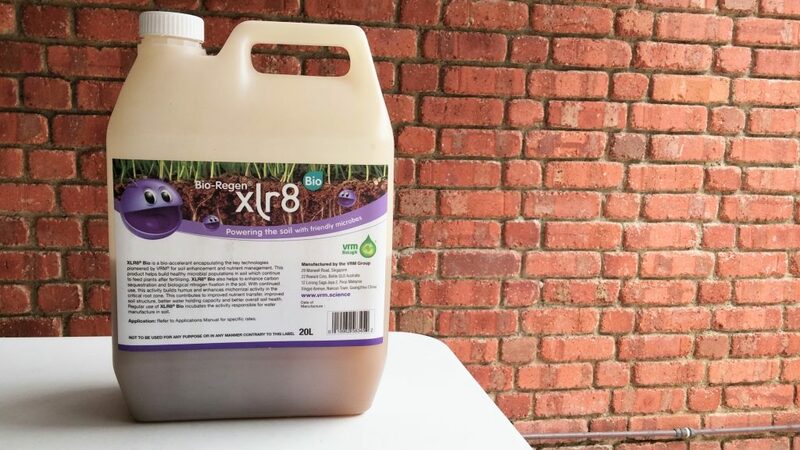 We are trying to observe if the XLR8® Bio solution would be able to revive those wilted sprouts in normal soil. 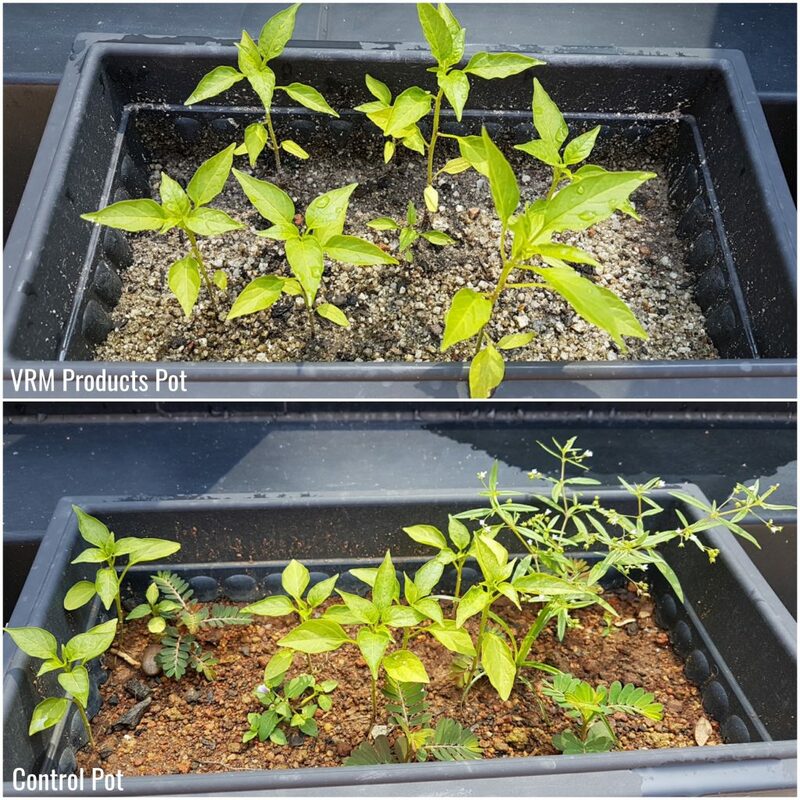 Latest picture of our chilli pots, interesting to see how the control pot has other unknown plants sharing the space but the VRM Products pot has just the chilli plant growing! All in all, we are very encouraged by the results and we are thinking of the many potential projects that could happen down the road. The experiment is still on-going and watch this space for more updates!